You think you know something and then it turns out you really don't know jack. 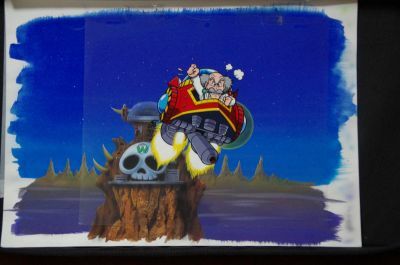 So, a while back Protodude reported on Yahoo Japan auctions featuring rare art, seemingly for Megaman 2 and Megaman 3. And I have to say I was very surprised to find that they look very similar to the art featured in Nintendo Power! From what I can gather from translation tools there's not much that's known about these items. They say these come from the collection of Mr. Hideaki Ito, an anime and special effects expert who worked on Thunderbirds and Space Battle Ship Yamato. As it happens, the auction had a bit more than just this. This guy has better images of the cell and is a little easier to understand when translated. I don't know if Nintendo Power specifically commissioned Mr. Hideaki for the poster, but it seems like they did. Just look at Quickman and the Gutsdozer. Quick even has the arrow on his chest, as opposed to the standard boomerang. 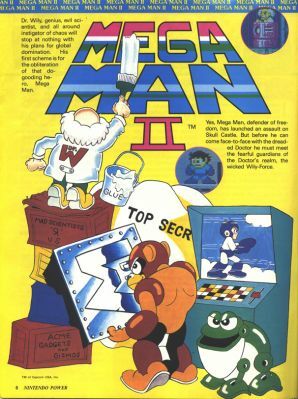 But I don't think Hideaki drew everything MM2 related for Nintendo Power. Even though it's obvious they took their cues from his posters (why didn't they use the one seen in the auction?). Similarly it looks like Capcom also used his poster, at least for reference! 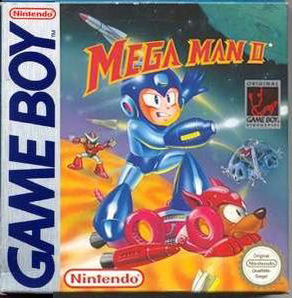 Those boots and those shoulders and overall proportions also look like they've been really influential for Megaman's box art. 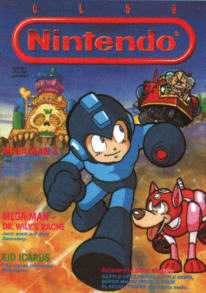 Megaman 3's art was used for the first Gameboy game and the PC games. You see them again for Megaman 2 (GB) although not on Europe's Megaman 2 box. 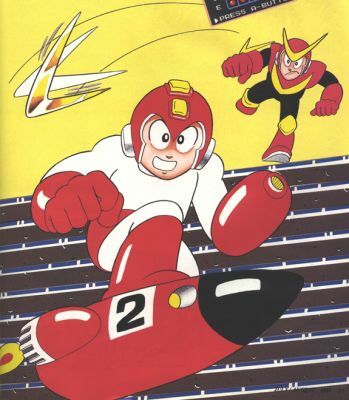 I find it so odd that Hideaki is a common link between Nintendo and the English box art and that, at one point, his art has a great influence on Capcom US' presentation of Megaman. Where was this art used though? Nintendo Power clearly had access to it. Yes, the art up there is based off Europe's box art, but it also seems to be based off Hideaki's poster (look at how Item-2 is drawn). Why didn't they use it? Was it because of Megaman's well drawn face? Could they not fit it in anywhere in the issue itself? Was it supposed to be for the cover? Or was it used for an entirely different magazine and Nitnendo Power only recieved a hand-me-down (the poster would belie this explanation, though, as it fits perfectly within Nintendo power's typical 3 page poster layout). One thing's for sure: we were robbed aas children. 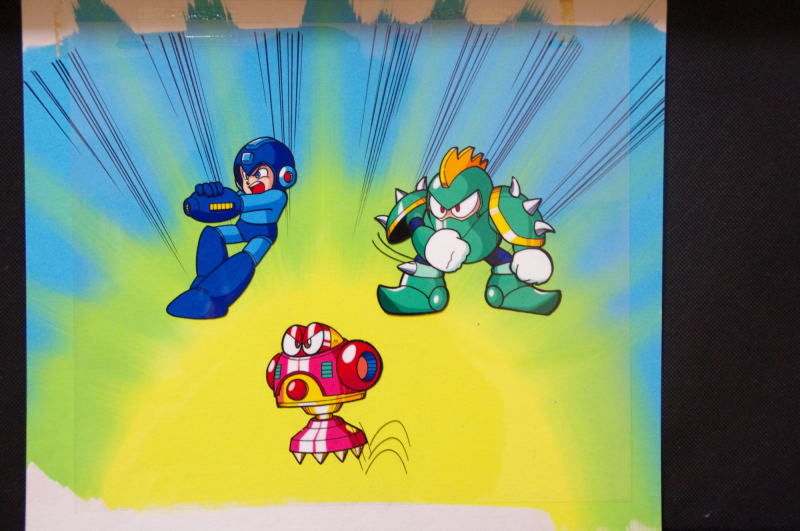 The second auction features art used for Club Nintendo's Megaman 3/ Megaman 1 Gameboy issue. 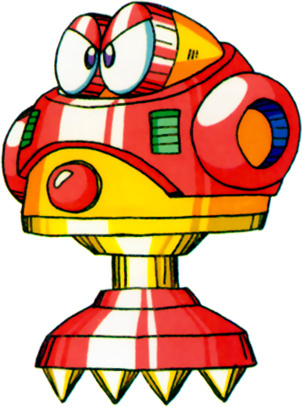 Clearly nobody told him Wily upgraded his machines. Wish I could find a better scan of this issue. 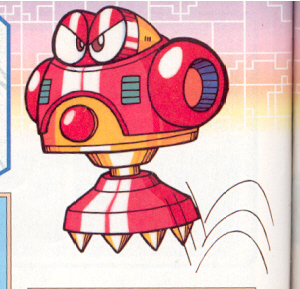 These images were also used in Nintendo Power's boss design contest. 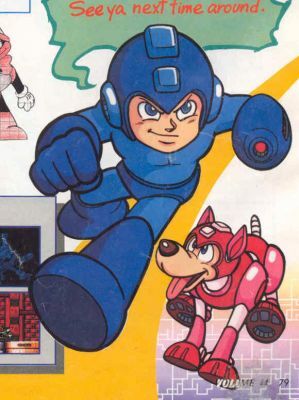 But Wily and Megaman seem to have been reworked, removing many anime-inspired elements from Megaman's face (foreshadowing the Ruby Spears cartoon?) 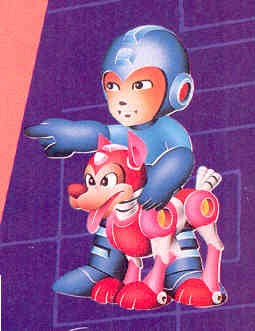 To me this suggests that this batch of images was something commissioned by Nintendo Power for their American audience. 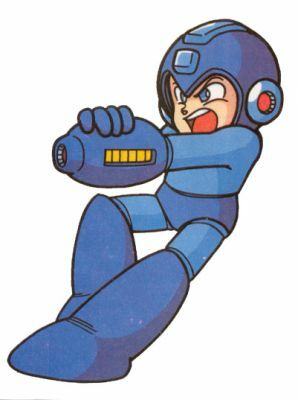 If it was something provided to them by Capcom I don't think we'd have an example of Megaman with a changed face (and Hideaki was the one who changed the face; evidence is below). 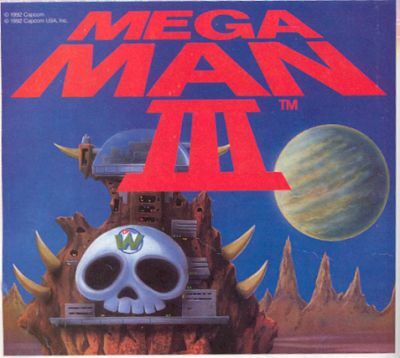 This was probably used for Club Nintendo first with parts being given to Nintendo Power as stock art. Obviously some sort of communication went on with Hideaki because he drew up all new art for Megaman 3 GB that was used in Nintendo Power (the same issue the above art was used in). This picture is from this blog. 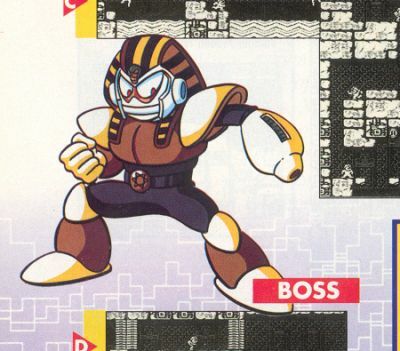 It's from the same issue as the boss contest, which explains why an alternate version of the above Wily is here too. Maybe Hideaki got confused between the two Megaman 3s? I'm shocked he actually painted that castle too (it's so different)! Was Wily originally supposed to be there? Or is it a mistake? 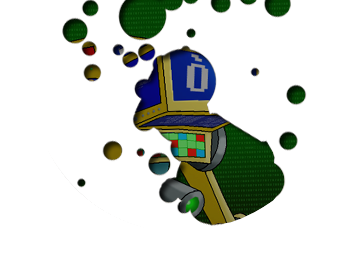 If he was intended to go with this background I can see why they took him out; he's in the wrong machine. 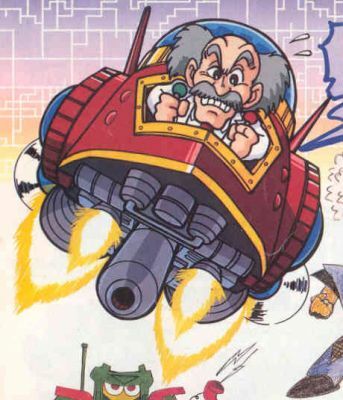 In the cell we see Wily in the Wily Machine 2, just like he is in the boss contest, in a similar pose, but in a different angle. More Nintendo Power images. And a background that doesn't seem to belong to them. 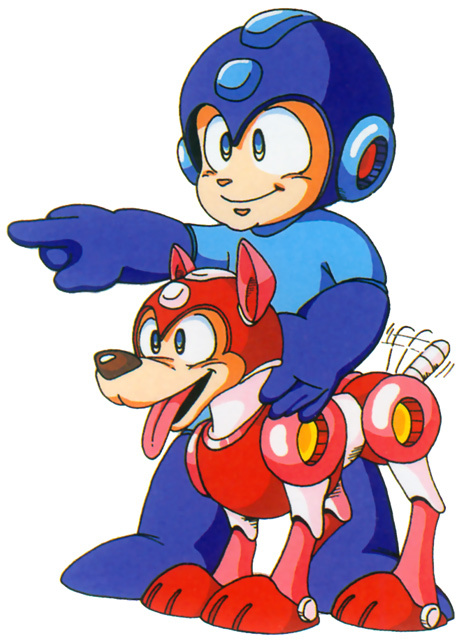 These had to have been drawn later than the image of Megaman running because Mega has his Americanized face here. 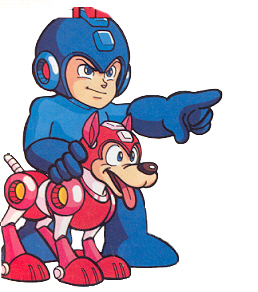 Punk and Megaman seem to be derived from looking at game stills while Jumpbig was derived from looking at the official art. I wonder where he got the green from. 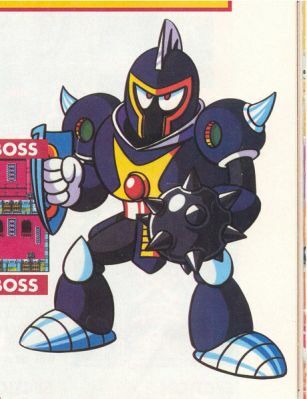 Not from the pile of scans; this image is from the boss contest in Nintendo Power (likely it's all drawn by the same artist).It seems Hideaki was Americanizing other pieces of official art. Sucking the Anime out of art was something done in the US at the time. 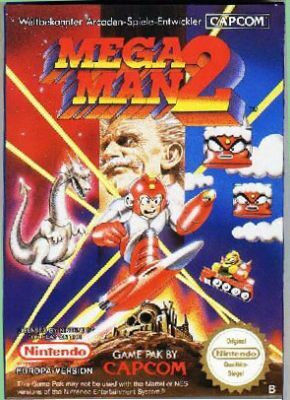 This is the US MM2 box art beside the Europe box art. 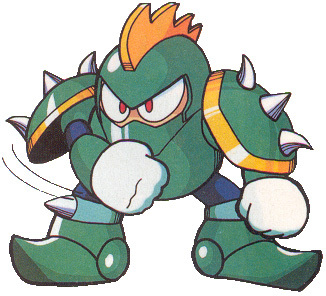 Europe's Megaman was clearly made to look like the MM3 (US)'s design for Megaman. I don't think Hideaki was involved with this (although who can say? ), but it's just something that was done. 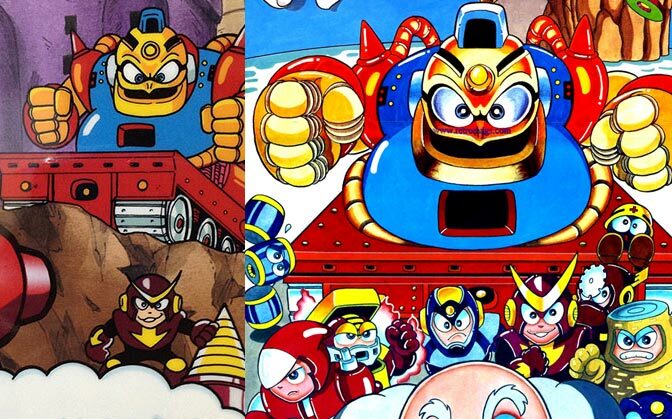 Nintendo power Americanized some Megaman 3 images as well for that issue as well; totally changing the designs in the process for some of the Robot Masters. Why? I expected this to be little more than just pointing out where those cells came from, but there was a bit more to them than I thought. It blows my mind to think at how involved one person was with the art found in Nintendo Power and how that connects with the actual official art for the early US NES games. It's likely the MM4 GB and MM6 related art was also drawn by the same artist. But what else has he influenced? Was there anything else? The same artist drew these pictures!? View the Nintendo power Gallery!